Returning to work after a workplace injury can be difficult both physically and emotionally. The best approach for returning to the workplace is to trust the advice of your doctor. While you may feel eager to return to work, returning before you have reached a complete medical recovery might result in further, and potentially more permanent injury. Therefore, you should only return to work once your doctor has recommended that you are able to return. Your employer may be eager for you to return on a full-time basis. However, your doctor may recommend that you begin on a part-time basis. Do not over extend yourself. Follow the advice of your doctor and return to work in the capacity that he or she recommends. It is important to remember that the insurer covering your workers' compensation benefits can periodically request an examination to evaluate your capacity for reemployment. Furthermore, they may stipulate without a request that you are eligible for reemployment without an evaluation. This is an attempt to force you to return to work. Reemployment benefits are designed to help you return to the workforce in a functional capacity, even if you are unable to perform your previous job. For more information, view the links below. 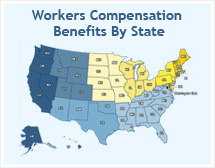 For a free evaluation of your workers' compensation case, click here. Who determines if I can work again? Can I be forced to return to work? What if I can't do my previous job?